Eades Mill01263 715779work01603 870304fax Self-cateringSurrounded by idyllic countryside, this 200-year-old mill is located over a quaint mill stream providing a comfortable and picturesque atmosphere. With plenty of charm, this property has been provided with wooden floors, brickwork and beamed ceilings to preserve its timeless quality. Guests can enjoy the many attractions of the local area including golf courses, a leisure centre, a selection of lovely walks and pubs serving food. Quietly situated in an idyllic rural position one mile from the town centre, this 200-year-old mill faces south and is located directly over the mill stream, offering glorious views of the surrounding countryside. 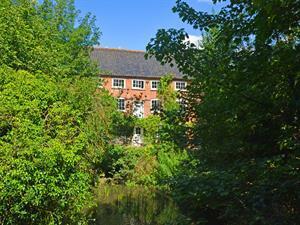 Surrounded by idyllic countryside, this 200-year-old mill is located over a quaint mill stream providing a comfortable and picturesque atmosphere. With plenty of charm, this property has been provided with wooden floors, brickwork and beamed ceilings to preserve its timeless quality. Guests can enjoy the many attractions of the local area including golf courses, a leisure centre, a selection of lovely walks and pubs serving food.